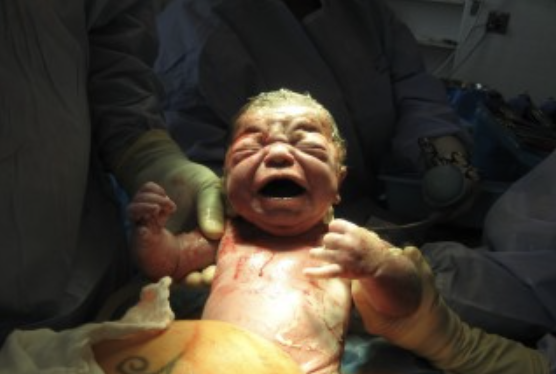 What Does Birth Trauma in Babies Look Like? Babies aren’t simply the adorable bundles of joy whose lives begin on the day they’re born. They are the thinking and feeling beings that have a big job to do in transitioning from momma’s womb to the outside world. Keep reading to learn how this natural yet huge transformation that is birth, oftentimes, is a traumatic experience for them in modern times! When thinking of trauma, we largely conjure up images of disastrous and catastrophic situations. There is a significant amount of research, however, that shows us that the any highly intense situation - especially where there is overwhelm, fear and helplessness - can have just as significantly a traumatic effect on our health. And, we generally know that the traumas that have the deepest roots in our lives are the traumas that happen the earliest, all the way back to experiences of young childhood - including birth and womb time - when we were fully conscious but not yet verbal. This may sound overly dramatic but it is now backed by science and solid research. Being born is a big and tender step in our life. We don’t pay enough attention of the psychological impact of childbirth on newborns—we assume that babies are not aware and won’t remember the pain of transition made even more difficult by maternity and newborn care given without this sensitivity. While it may not be written in our conscious memories, experiencing birth remains in our very cells, and is certainly within our subconscious - influencing much of our behavior, reactions and perspectives later on in life. How we relate, in our adult lives, to stress at home or work, pressure from loved ones, how we go about making our toughest decisions can very well be traced back to how we experienced birth, when our response to stresses within our nervous system were developing. Let’s take a look at how a baby should experience birth and why he or she may have a traumatic experience instead. In looking at why a baby experiences trauma, we’ll delve a bit into the possible causes and symptoms that come with birth trauma in babies. This is the starting point for why we should begin to rethink who babies are and what they’re trying to tell us! On the physical level, birth happens naturally by a complex series of biological events believed to be initiated by the baby. When baby is ready, it is their biological priority and they navigate their way down the birth canal with the help from the contractions of mama’s uterus, her instinctive pushing, gravity and mobile positioning. 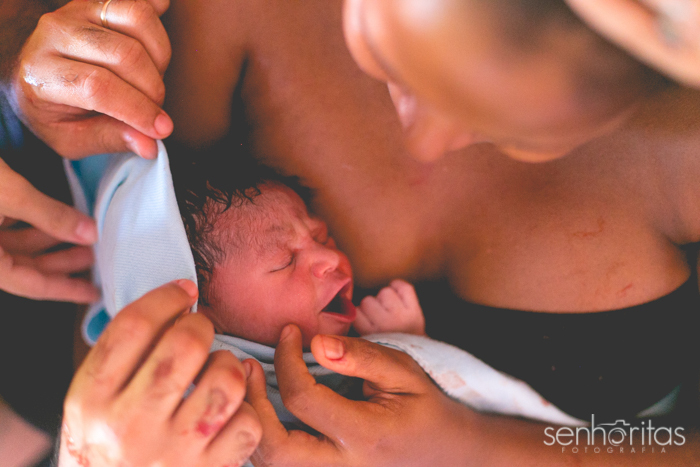 An immediate connection to the mother and breastfeeding are crucial after birth to begin bonding and for the baby’s healthy development. Basically, anything that interrupts this entire process can be experienced by the baby as invasive, overwhelming and really scary. Related: Birth Trauma for Moms: What is it? Symptoms and Prevention. Birth itself is tough enough without even considering interventions. 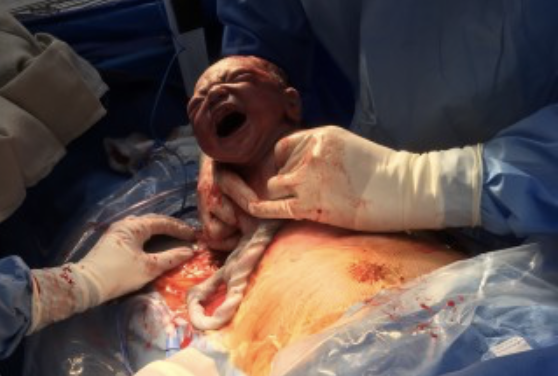 Going down the birth canal includes twisting, turning in the body as well as with the head and neck, not to mention all of the compression and pressure the baby feels. But we as a species have handled it just fine, born into a calm community of love and support, soothed in the warmth and comfort of mama’s chest, quiet surroundings, soft lighting, demand breastfeeding and babywearing. If the baby feels overwhelmed and frightened at any time, this feeling can be kept locked into their bodies as trauma until they work it out of their system after birth. But, it also can impact them for a long period of time, developing into behavioral and learning difficulties in the child’s later years. We know from decades of research in neurology, embryology, and psychology, that newborns are born fully aware and conscious. They are exquisitely sensitive – even more vulnerable to acute or chronic stress and trauma than adults. Consciousness actually begins in the womb. We have known for years, that drugs, alcohol, nicotine, poor nutrition, and certain infections in mom can drastically affect the unborn baby – altering DNA and genetic expression, as well as physical, mental and emotional development. What mom eats, drinks, breathes, thinks, feels, and experiences goes right to the baby. So does her stress hormones. We are learning that trauma from high impact experiences during childbirth is not only stored as nonverbal memories within newborns, it impacts their life at a critical time in their development, affecting short and long term physical and mental health – their entire neurological system, from their learning capacity to mental orientation, emotional stability and stress management. 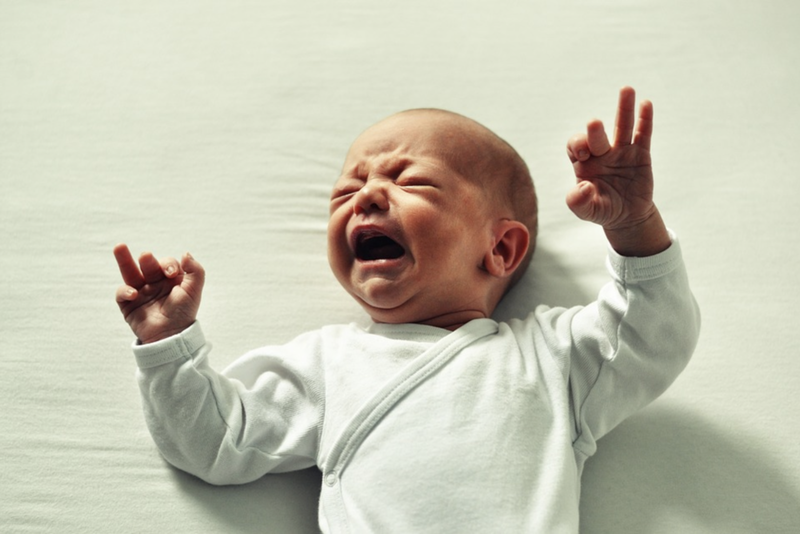 The fight or flight stress response creates a strong memory in babies and leads to similar responses to similar cues until resolved in their nervous system. 80% of children with sensory processing disorder, ADHD, developmental delays and autism have a history of birth trauma. This is staggering. So, what are some of these threatening and overwhelming circumstances? The typical hospital birth today will include an array of drugs and procedures just to get started! These are administered to the mother for inciting stronger, more frequent contractions, sedation for sleep and anesthesia to numb the pain. But, a baby is, of course, susceptible to anything the mother has been given since its conception all the way through to the breastfeeding stage. In additional to being flooded with stress hormones that mom feels from her own fear, the manner in which she is treated and interventions she doesn't really want, babies experience actual trauma from the aggressive way they are often ushered from the comfort of the dark cozy womb attached to their mother, to the world. - be given formula and pacifiers instead of their mother’s breastmilk and skin to skin comfort….and this is routine and standard in most US hospitals and some other parts of the modern world. I am not even including the effects of NICU treatment and procedures (even if necessary), or being strapped down for medical circumcision. And, this doesn’t include the effects of the environment the baby’s born into. The light is too bright and too harsh in the delivery room and nurseries, and the noise level is also much too high. There are possibly needle injections to administer vitamins but also to draw a large blood sample for testing. The standard birth today just doesn’t encourage a safe, quiet, intimate, and private environment for mother and baby to flow naturally within it. This type of maternity care definitely does not promote trust or give baby the message it is safe, kind or comfortable to be here. It certainly does not help to enable a tender bond to develop between mother and baby. It actually elicits their instinctual stress response of fight or flight. And when there is fear of harm, overwhelm, helplessness and inability to fight or flee, their nervous system gets stuck in trauma. It’s no wonder that some babies are so “fussy” or won’t breastfeed with ease or are experiencing colic. Why do we need these reconstructive therapies? What kind of effects come with birth trauma in babies? What Kind of Effects is the Standard Birth having on Our Babies? When looking at birth from a baby’s perspective, it does indeed sound traumatic and unfathomable, but these practices are all too common and routine. Common practices do not make common sense and contribute to poor outcomes - the US ranks near the bottom as compared to other modernized countries in terms of maternal and newborn morbidity and mortality, despite high rates of medical and surgical interventions. In the United States, 23% of all births performed in a hospital are induced; this means the mother is given drugs and chemicals to induce more frequent and intense contractions. And, 65% of those women will also be given epidurals on top of that to cope with the unnaturally intense pain from the medications. Furthermore, 33% of births in America wind up in a C-section. These numbers no longer seem ordinary when compared to natural births in which 95% of them will deliver healthy babies without intervention. -bonding issues, decreased eye contact, glossed divergent eyes. “‘Most parents and professionals consider it ordinary for infants to awaken during the night, cry for long periods, have gastrointestinal distress, or be irritable. Few parents or professionals have seen trauma-free babies, so few have experienced babies who are symptom-free. We’ve assumed, for a long time, that baby’s are little, cute and albeit empty and emotionally unfeeling creatures when they come into the world. And, the research to fully understand who these amazing beings are is still unfolding and is only now gaining momentum. In the meantime, how do we help our babies heal from birth trauma or help them avoid it altogether? In part two of this series on birth trauma in babies, we’ll take a look at how we can prevent birth trauma and how to heal it if your baby is already dealing with it. Preventing birth trauma for moms - Birth Trauma for Moms: Prevention and Healing - will go a long way in preventing it in babies. If you’d like to know more about holistically healthy and joyful birth be sure to sign up for my newsletter or read my books. I have a holistic approach to life, including healing after pregnancy and birthing. Nothing replaces abdominal toning and exercise for restoring muscle strength and tone - which I encourage for all mamas as soon as they feel up to it postpartum. Nothing replaces touch, slow deep abdominal breathing, and a 'love your postpartum body' perspective that I promote. But I have found many mamas simply feel comforted by this support garment, especially early postpartum and temporarily as needed....to be used without forfeiting abdominal toning and strengthening exercise, breathing well and touch. I have found Bellefit supportive garments to help like they use belly binding around the world such as in Indonesia. They do aid in early postpartum healing and provide support many mamas feel comforted by. I deal with human beings and the reality is many postpartum mom's struggle with body image, feel frustrated that getting back to themselves takes longer than expected. Being into holistic health and healing includes being sensitive to real human struggles - the mind, body, heart and soul of each person and their unique situation. Having helped countless women with these issues after having a baby as a midwife, I have found many still love that binding and feel better with this support, and ability to fit into their pre-pregnancy clothes comfortably and sooner than they would if they went through a C-section or natural childbirth recovery without it - especially when they have to dress up and fit into a certain favorite outfit for a special occasion or wedding not long after having a baby. For more info on the Bellefit girdle, check out my blog about it here. Have a Great Postpartum Recovery (with a little help from Bellefit)! I am thrilled to announce that you get a $20 Off with code: ANNE20 at checkout - if you purchase here.